Orson Welles was arguably the finest cinematic interpreter of Shakespeare, although he only made three features based on the Bard’s works. 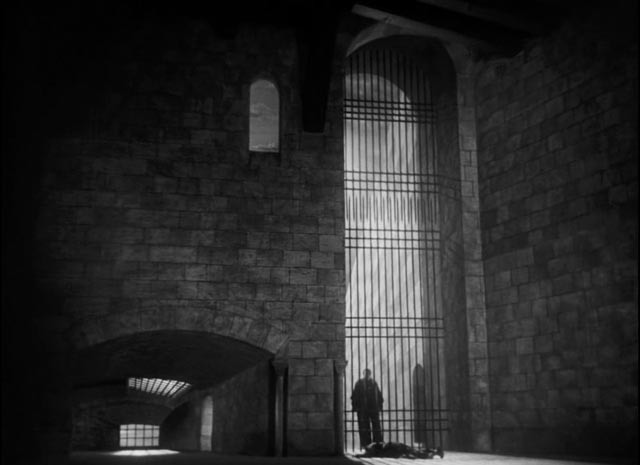 The first of these, made remarkably for the budget studio Republic Pictures, was Macbeth (1948), which he shot on stylized sets, steeping Shakespeare’s horror play in a thick atmosphere of Gothic gloom. The third, Welles’s masterpiece, was Chimes at Midnight (aka Falstaff, 1965), a long-nurtured conflation of the history plays Henry IV parts one and two, Richard II and Henry V, with a dab of The Merry Wives of Windsor, which focused on the character of Sir John Falstaff, which is one of the greatest meditations on mortality in all cinema. Welles’s approach to Shakespeare was not one of slavish fidelity, nor one of trendy updating. He freely cut and rearranged the texts in order to create films which are distinctly cinematic rather than theatrical, evoking the spirit rather than the letter of the original works. More than any other filmmaker, he situated the plays in imaginative evocations of the worlds in which they were set; there is a powerful air of period authenticity, particularly in Chimes at Midnight (which shares with Andrei Tarkovsky’s Andrei Rublev  the feeling of having actually been filmed in the Medieval world), but also in the second of his Shakespeare films, Othello (1952/1955). A key film in Welles’s development as a filmmaker, Othello was the first of his itinerant European productions, made over a period of years as he grabbed bits and pieces whenever finances allowed. Without the studio resources he had had in Hollywood (as troubled as those earlier productions might have been), he no longer had the leisure to craft his signature long takes and complex camera choreography. On Othello, he might shoot the performance of one actor in a scene only to shoot the reverse angles on another actor a year later in a different location over the shoulder of a stand-in for the original actor. Because of this patchwork quality, it was on Othello that Welles developed a mastery of editing, and with his innate feeling for cinema he turned a major disadvantage into a powerful asset. Othello is a masterpiece of montage which draws on the traditions of late silent visual storytelling while looking forward to a freer, more expressive technique presaging the increasingly self-conscious use of camera and editing which flourished in the industry of the ’60s and ’70s. 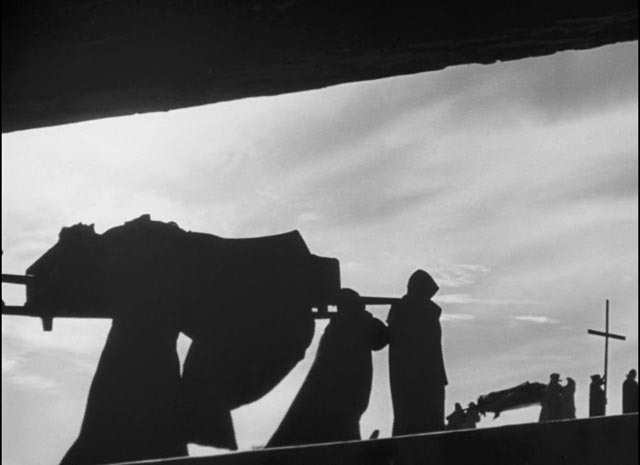 Othello opens with what may be the single greatest sequence of Welles’s career: beginning on a close-up of Othello’s dead face, the camera cranes up as he is carried away on a funeral bier. 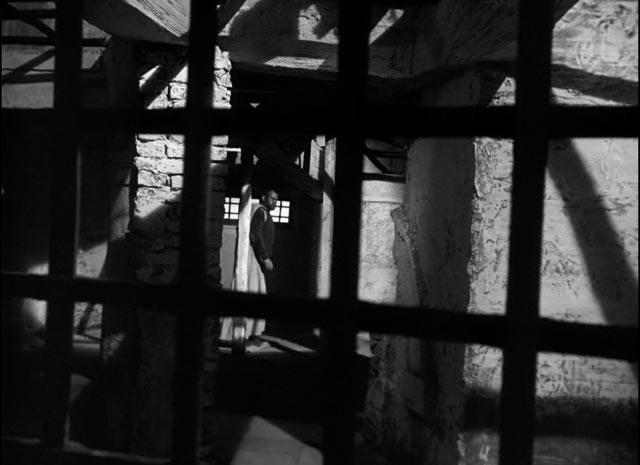 In a series of striking shots which combine stark geometric compositions with imposing architectural spaces (filmed in an ancient city in Morocco), we see silhouetted figures arranged in multiple intersecting planes from looming close-ups of Othello and then Desdemona in foreground profile, to increasingly distant lines of figures moving in diagonal patterns across ancient stone pathways and walls, all set to an escalating, mournful choral dirge. 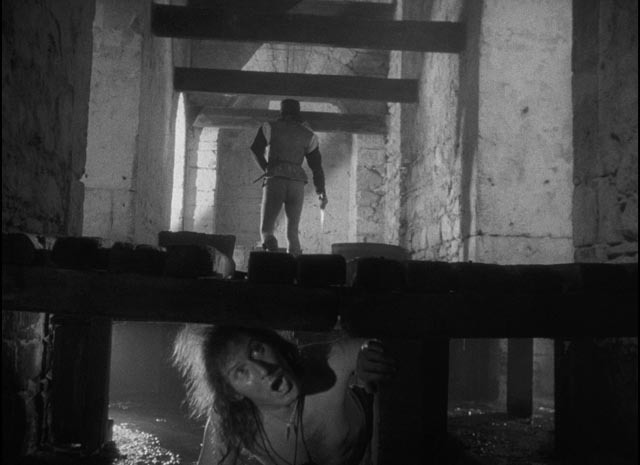 The relentless melancholy atmosphere of the funeral is intersected by the sudden appearance of Iago being dragged in chains in the opposite direction, pulled through the crowd until he is finally pushed into a small iron cage, his face thrust into close-up through the bars, eyes wide with a not-quite-decipherable expression which may be madness or desperation. 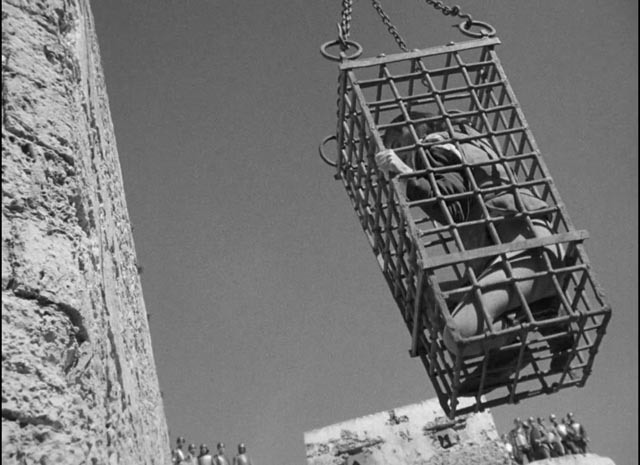 The cage is hoisted on a chain to hang from the ramparts from which he can observe the continuing funeral of the two people he has deliberately destroyed. In beginning the film with this prologue, Welles acknowledges that his audience knows where the play’s story will lead and declares that his concern is not so much what happens as it is the reasons behind what happens. Othello the play is, in some ways, one of Shakespeare’s most problematic works. From a modern perspective, the issue of race seems paramount – Othello is a Moor who has attained high rank in the Venetian army, leading to victory against the Turks and being lauded by society for his military prowess. But he is not only a foreigner; he’s also black. He stands outside and apart from the society which honours him and so, when he takes the daughter of a nobleman as his bride, he asserts a desire to belong to that society fully while simultaneously violating its norms. Desdemona becomes his wife in defiance of her father Brabantio and so this wedding, rather than binding Othello closer to Venetian society, marks his difference more starkly. The question of race has historically been further complicated by the fact that the character has traditionally been played by white actors in blackface. While for centuries this was a theatrical convention, to a modern audience it causes at the least some discomfort. Welles, in his trimming of the text and in his performance itself, actually plays down the issue of racial difference (in contrast to Laurence Olivier who, in his 1965 version, plays the part as a bug-eyed caricature which embarrassingly crosses the border into outright minstrelsy). 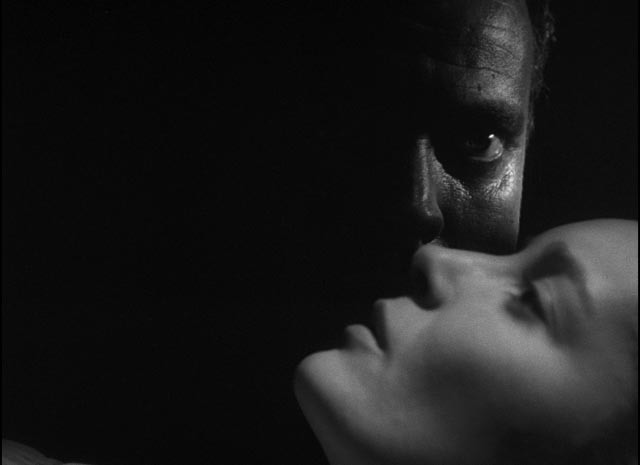 Welles’s Othello is an outsider, but that has more to do with his being a foreigner than his being Black. Race seems to play a minor part at best in Iago’s determination to destroy him. That determination has always been the second large question which looms over the play. Coleridge spoke of Iago’s “motiveless Malignity”, suggesting that every reason Iago gives during the play for his actions is merely an excuse; that what really drives him is nothing more than an urge to exert destructive power over those he considers his inferiors though socially they stand above him. Welles provides a more modern, psychological motive for the villain, jealousy driven by sexual impotence. 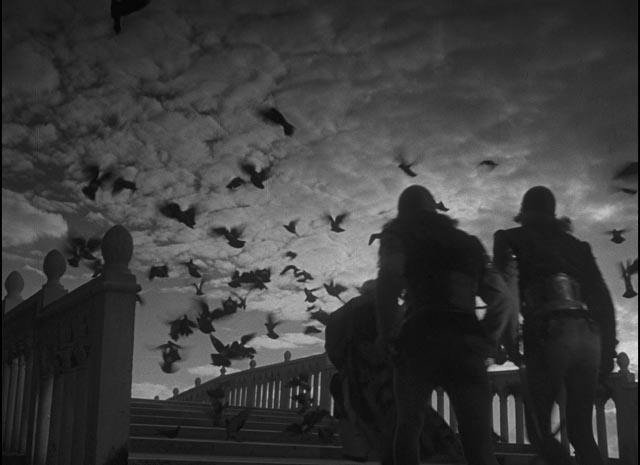 In the 1952 version of the film, this is bluntly asserted as Iago and Roderigo observe the secret wedding of Othello and Desdemona from the back of the church and Iago says he hates the Moor because he believes that Othello has cuckolded him by sleeping with his wife Emilia (a line cut from the revised 1955 version). Iago asserts his influence over others because he is incapable of asserting himself sexually – something hinted at in his relationship with Emilia and also visually in a number of instances in which he pokes or stabs men with phallic objects like sticks and swords. That his master Othello wins the affection of a noble woman inflames his jealousy and resentment and he determines to do what he can to smash the marriage, in the process also destroying Cassio, an officer who has received the promotion he believes was his own due. So much for Iago’s motives. The final large question of the play is why is Othello so easily manipulated by the villain into destroying Desdemona and himself? The risk here is that Othello can appear too naive. Welles’s conception is not fully supported by his performance – and this may easily be a result of the sheer effort he had to sustain over a period of years holding the film clearly in his imagination as he accumulated all the elements piece by piece. As has been said more than once, Welles the actor was not best served by Welles the director. He himself later said that he was still too young to fully embody the character. The intention, though, is fairly clear. Othello is a powerful masculine figure, a soldier and general who is accustomed to the company of men in the field, but largely a stranger to the polite society of men and women. He won Desdemona’s admiration and then love through accounts of his military exploits (the very things which have earned him honour and admiration in Venetian society) and his love for her has come in response to that admiration. It is, in a sense, rooted in flattery. His attraction to her is a response to her youth and purity rather than a full-blooded desire for her as a woman. Therein lies his vulnerability; she is an object for him who stands for all that is missing from the masculine life of the soldier. Iago’s power over Othello lies in his position as an integral part of that masculine life. Bound closely by their shared experiences in war, Othello can’t conceive of any betrayal by Iago. But his unfamiliarity with women and polite society make him susceptible to doubts about Desdemona’s behaviour for which Iago carefully and methodically lays the groundwork, all the while assuring his master that his only concern is to protect Othello from betrayal. Once the seeds have been sown, Othello is paradoxically bound increasingly close to the one person who wants to destroy him, his distrust expanding to encompass both Desdemona and his trusted officer Cassio. In a sense, gender is more of an issue than race here. Or rather, insecurity at least partially rooted in racial difference is skillfully turned by Iago into a distrust of the gendered Other. Othello only comes to a degree of self-awareness after it’s too late. He has already killed Desdemona before he realizes that Iago is the true source of betrayal. He has been played the fool by a more cunning man, but even with that new self-knowledge, at least from a modern perspective, I’m not sure he can be considered a classical tragic figure. He is too easily convinced that he is the victim, an attitude which comes closer to self-pity than tragedy, and in the end isn’t his expression of despair still more about the betrayal of himself than it is about his brutal destruction of an innocent woman? Othello is a complex play and Welles has compressed it in interesting ways, but in the final event what gives his film its great power is the cinematic embodiment of the drama. This is a remarkable visual experience, the expressionist camerawork and dynamic editing creating for the viewer a powerfully visceral equivalent of Othello’s increasing instability and disorientation. 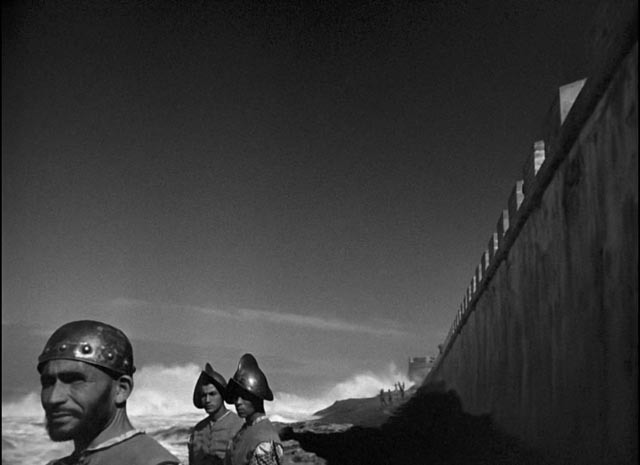 Welles was a master at controlling the emotional effects of film (reinforced by a rich score by Angelo Francesco Lavagnino and Alberto Barberis) and it might be argued that in Othello he achieved a near perfect synthesis of style and substance … all the more remarkable given the circumstances of the production. But even though the film won the Grand Prix at Cannes in 1952, it has always had its critical detractors. Much of that criticism has been rooted in the technical consequences of its protracted production. As with most of the European films, circumstances prevented Welles recording sync sound and, like many a great Italian director, he wasn’t as concerned as the professionals back in Hollywood with technical perfection in the dubbing. One work-around he used frequently was simply to use camera angles which didn’t fully reveal an actor’s face, so that lines could be laid over the image without concern; but in many other instances, there is a discrepancy between what we see and what we hear. Welles was more interested in the quality of a line reading than with making it fit perfectly with the movements of an actor’s lips. This seeming casualness about “realism” bothered American critics more than Europeans and was often attributed to sloppiness on Welles’s part. And yet it becomes less and less important the more willing you are to immerse yourself into the flow of images and language. Welles was more concerned with a convincing and immersive psychological experience than with a superficial representation of “reality”, and nit-picking about supposed technical imperfections is irrelevant both to his creative intentions and the emotional experience of the viewer. Because of the film’s emphasis on creating a visual world and the somewhat distancing effect of the dubbing, performances are to a degree a matter of physical expression – faces and body language – in a sense making the film more closely related to silent than to sound cinema. 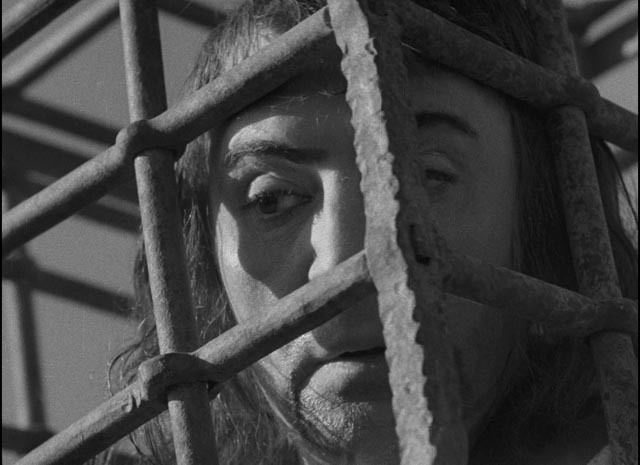 In this sense, Welles’s attention to faces (aided by as many as seven cinematographers over the duration of the production) is crucial to the overall effect. The cast is excellent, from Micheál Mac Liammóir as Iago to Suzanne Cloutier as Desdemona, from Robert Coote as Roderigo and Michael Lawrence as Cassio to Hilton Edwards as Brabantio … with Welles himself perhaps not quite rising to the demands of his role as Othello. There are two distinct versions of the film, the first rushed to completion in 1952 to meet the deadline for Cannes, the second re-worked by Welles for eventual release in the U.S. in 1955. Certain differences between the two versions are immediately apparent, the most noticeable being the replacement in the U.S. version of the original spoken credits by more conventional title cards and the insertion of a voice-over which sets up the story and characters. 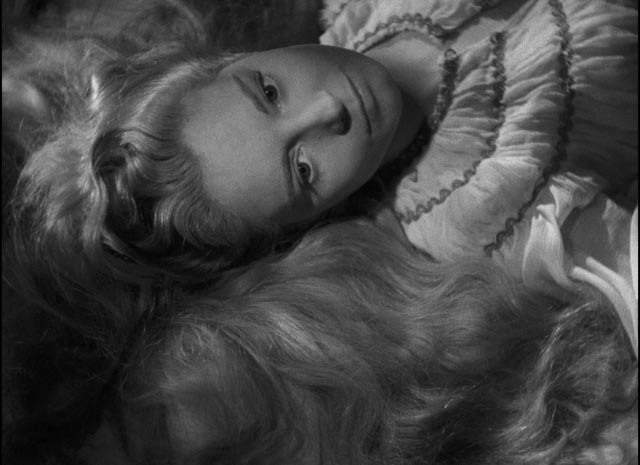 In addition, Welles replaced some of the original dubbing in the later version, particularly removing Suzanne Cloutier’s delicate voice and subtly changing the character of Desdemona to something more assertive with the voice of actress Gudrun Ure, who had played the role opposite Welles on stage in the interim. Personally, I prefer the original version, but that might just be an effect of watching both back-to-back. 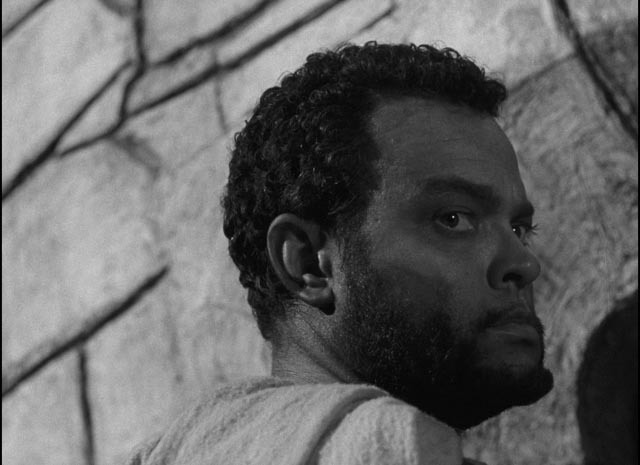 Criterion’s two-disk Blu-ray edition of Orson Welles’s Othello is one of the most substantial releases of the year. Both versions of the film are presented in 4K scans which support the richness of the imagery with strong contrast and fine detail. The 1952 European version was scanned from a fine-grain positive, while the 1955 American version was scanned from the original negative. While these scans make flaws in the original material apparent (dirt on the lens in some shots, for instance), both versions show a satisfying degree of natural film grain. The sound tracks are more problematic, with dialogue occasionally sounding a little unclear, a problem slightly exacerbated by the dubbing which is so frequently laid over images in which we don’t clearly see the speaker’s face. But again this is a minor problem because the film creates its effects primarily through the dynamic flow of its images and even if occasional lines are not clearly heard, their sense is always clear. Criterion has loaded this edition with a rich collection of supplementary materials, beginning with an audio commentary from filmmakers Peter Bogdanovich and Myron Meisel which was recorded for the company’s 1995 laserdisk edition. Between them, they fill in a lot of details about the production, but also get deeply into an analysis of the film’s themes, its relationship to the original play, and the specific nature of Welles’s methods of adaptation. On a second disk, Criterion have included four-and-a-quarter hours of additional supplements. Return to Glennascaul (28:06, including a 4:24 introduction by Bogdanovich) is a short film made by Hilton Edwards in Ireland during a hiatus in the production of Othello. It features Welles as himself, stopping to help a stranded motorist one night; this man tells him of a ghostly experience he had on this same road a year earlier, having picked up two women and driven them home, only to discover later that both had been long dead and the house abandoned. It’s a charming little ghost story made with humour. Souvenirs d’”Othello” (48:46) is an interview with Cloutier shot by director Francois Girard in 1995 on various locations where Othello was filmed. The actress speaks fondly of her memories of the difficult shoot and more particularly of her personal relationship with Welles over the years. Film scholar Francois Thomas (18:12) discusses the differences between the two versions; film historian Joseph McBride (32:44) talks about Welles’s performance and the issue of blackface, as well as what he sees as the irrelevance of the film’s supposed technical weaknesses; actor and Welles biographer Simon Callow (21:55) goes into detail about the fractious relationship between Welles and Mac Liammóir; and academic Ayanna Thompson (21:12) speaks about the history of the play and its racial component, as well as delineating the plot’s connection to classical farce. With this release, Criterion has made accessible an important piece of film history and a crucial element in Welles’s development as one of the most significant independent filmmakers before that term had gained meaning. This disk is definitely one of the high points of the year. This entry was posted in Commentary, Review and tagged Actors, Blu-Ray, Criterion, Directors, Film History, Literary Adaptation, Orson Welles, Restored Films. Bookmark the permalink. Fine stuff. I must watch it again. Definitely worth another look, Grant. Did you ever teach the play in high school? How did you approach its issues?